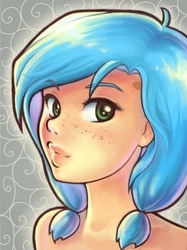 DestinyBlue is a full time anime artist who travels all over the UK exhibiting, teaching, and drawing. She has run numerous workshops on drawing manga, including demonstrational videos for Kuretake UK Kurecolour Markers, and 'how to draw' classes for the BBC and many conventions. She has recently been featured 'best in western talent' in NEO magazine. DestinyBlue is storming her way into the frame across the convention circuit in the UK and Ireland and has accumulated a considerable number of fans of her artwork both online and off. Check out her DeviantART page for her full convention schedule.